I will betroth you to me in righteousness and in justice, in steadfast love and in mercy. 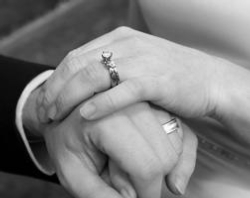 Couples who would like to celebrate their wedding at St. Catherine of Siena should contact Susan Daley at susan@stcathchurch.org at least six months prior to wedding. Wedding date and time is not set until the marriage preparation process has started. Preparation is mandatory for all couples before marriage in the Church. Parishioners as well as non- parishioners are welcome to celebrate the Sacrament of Matrimony here at St. Catherine of Siena. Weddings are celebrated at Noon and 2:30 P.M. on Saturdays. If you are considering a week day wedding (Monday through Friday), time is flexible depending on priest's availability. Parishioners are those who are registered and have been active at the parish for one year or more. Please contact our Pastor, Father Ken Schmit to assist you in the process of applying for an annulment of a previous marriage. This may be a lengthy process (one year or more), please allow for this additional time when planning your wedding.